Previews for the New Village Arts Theatre production of Stage Kiss begin this weekend (January 30, 2015) with pay-what-you-can ticket pricing. PWYC tickets are subject to availability, and are first-come first-served starting an hour before the performance. There is no guarantee that all patrons seeking tickets via the PWYC option will receive a ticket. . . Reserved seats are available for preview performances at $24 a seat. These seats can be purchased anytime via the NVA Box Office or www.newvillagearts.org. This option guarantees you a seat! This is the West Coast premiere of Sarah Ruhl’s play about what happens when lovers share a stage kiss, or when actors share a real one. For more information, please click the link. You’ll never look at a classical guitar, standup base or tap dancer the same after experiencing Besos de Coco’s eclectic mix of jazz, Brazilian, and classical music. They will be playing a winter concert at the Carlsbad Library’s Ruby G. Schulman Auditorium on Saturday, February 7, 2015 at 6 PM. This fun and flavorful trio features classical guitarist Lorraine Castellanos, double bassist Evona Wascinski and tap dancer Claudia Gomez Vorce, whose magical footwork conjures the sound of percussion instruments. Thinking a good, solid Catholic school education might be right for your kids? If so, Carlsbad’s St. Patrick Catholic School has just the K-8 institution for you and they’re having an open house on Sunday, January 25, 2015 from 10 to 11 AM you can check it out and meet the staff. The local Carlsbad music scene keeps rolling this weekend with a January 9 &10, 2015 performance by Berkley Hart Selis Twang at the New Village Arts Theatre. The group made up of seven-time San Diego Music Award winner Eve Selis, and Marc Intravaia, Jeff Berkley and Calman Hart. The New Village Arts Theatre is located in the heart of Carlsbad Village at 2787 State Street. Show starts at 8 PM. Click here for tickets. 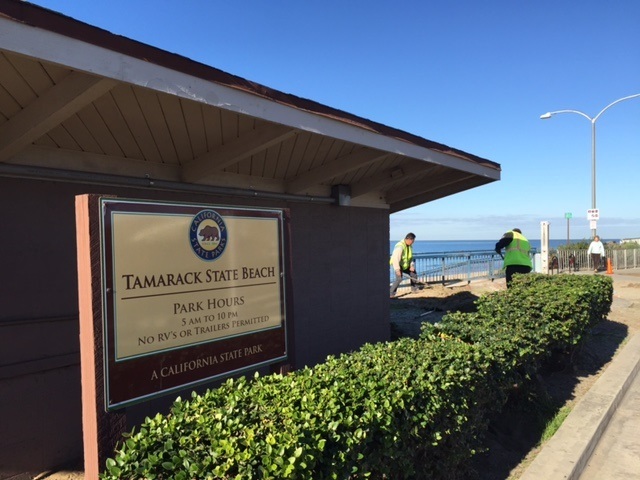 The restrooms at Carlsbad State Beach near Tamarack Avenue will be closed starting Monday, Dec. 29, through the end of January for some long-awaited maintenance and upgrades. Temporary restrooms will be available in the Tamarack Avenue parking lot, and restrooms at the Pine Avenue ramp will remain open, with extended hours, from 7 a.m. to 10 p.m. daily. The work on the restrooms will include fresh paint, an epoxy floor, new fixtures and partitions, an upgraded plumbing and electrical system, and a refurbished roof with new skylights. While the restrooms are being improved, crews will also install new hand railing to replace the corroded rails near the restrooms, as well as a new shower and drinking fountain outside. The restroom’s pump station has already been equipped with a new alarm system that will sound if there’s a spill, to prevent beach contamination.